"Say, kids, what time is it?" While people of a certain age (ancient) are perhaps screaming about an ugly red-headed puppet, those of us living in the computer age know that the answer is, of course, ClickPLAY Time 2, aka ClickPLAY Time Harder! Ninjadoodle is back and clickier than ever in the latest sequel to the rapidly growing ClickPLAY family. The point and click puzzle game that likes to tease us with attempting to actually start a game has brought 20 more levels of clicking madness. ClickPLAY Time 2 Walkthrough now available! 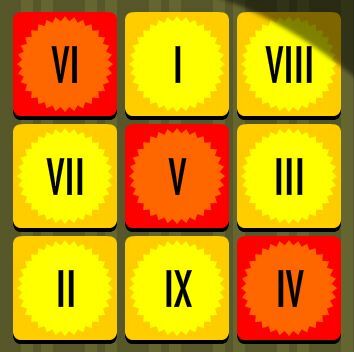 Your score is based on the time spent solving the puzzles, the less time used, the better the score. Don't be afraid to click anywhere and everywhere, the number of clicks does not count against you. Pay attention to colors, many of the puzzles are color-based. There will be directions for the color-blind. Good luck and click play! Click on the car to make it move forward. Click on the pyramid to tip it over. Click on the sun (low on the horizon) to bring it up. Click two tiles to swap them. Note the bow and arrow. The name is Robin Hood. This is a find the differences game. You need to find and click 5 differences. 2) The left ear (look for the arrow). 3) The stem of the apple. 4) The bottom of the monocle chain. 5) The middle of the bowtie. The clue is MEOW and A=1. You are looking for a four digit code. A cat says MEOW (But what does the fox say?). Using the simple number/letter substitution, C=3, A=1, and T=20. Note the bricks above the guy. The bricks are five colors, from left to right: yellow, green, blue, red, and yellow. Note the little sign to the right that says RYGBY. 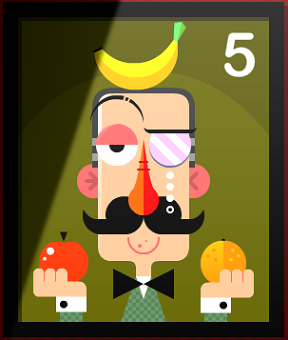 You want to move the little guy underneath a color (by clicking the color), then clicking the little guy to jump. You need to have him jump in the order of the sign, red, yellow, green, blue, yellow. Note: It doesn't matter which yellow, it works both ways. For the colorblind: imagine the sections of brick numbered 1 through 5 from left to right. Click on section 4 (red) to move the little man, then click on the little man to make him jump. Then have him proceed to number 5 (yellow), number 2 (green), number 3 (blue), and number 1 (yellow). Note the martini and the playing cards. The answer is James Bond. The object is to move the kids so that the tannest is #1, and the least tan is #6. Click on the far left kid, and move him to the far right. Move the third from the right kid to the second from the right position. Move the second from the left to the third from the right position. Switch the second from the left with the third from the left. Note that certain letters in the paragraph are bolded. The bolded letters are: twonineonetwo. Here you have to match the dental charts to the...whatever those things are. The dental charts are, from left to right: blue, green, and red. The animals are (look at the eye color): green, red, and blue. Once you can match the chart to the animal, click on the animal's nose too open their mouths. Use the chart to remove teeth. Each X on the chart is a tooth to be removed. The answer is Rocky Balboa. The objective is to move the panels until you have a complete comic. Click on two panels to swap their positions. Swap the far left and the far right panels. Then swap the far right with the second from the left. Swap the third from the right with the third from the left. Swap the third from the right with the fourth from the left. Swap the third from the right with the fourth from the right. Swap the far right with the second from the right. Enjoy the cartoon about meeting chicks. This is a four digit answer. Note the graphic above, with the four colored buttons (purple, red, yellow, and green). Also note the rectangle, with the same colors: upper left red, upper right yellow, lower left green, lower right purple. Also note the name of the level. Move your cursor to outside of the white rectangle in the upper right and you should see it turn into a hand. Click (knock) three times and a number will be revealed. Do this at each corner and get four numbers (4, upper left, red; 7, upper right, yellow; 8 lower left, green; and 3 lower right, purple). Place the numbers in the same order as the buttons and you get 3478. Power is now running through the lines. The objective is to set each of the arrows so that power not only runs to the one at the bottom far right, but also runs through each arrow. Here's a Screenshot of the solution. The better clue to this one is in the title of the level. The answer is John McClane. The clue on the left is telling you that all rows, columns, and diagonals should equal 15 (XV). That makes this a "magic square" puzzle. The red numbers (upper left to lower right diagonal) are already in place and locked. Another four digit code is needed. Squint at the graphic really hard. Yes, seriously. If you are wearing glasses you can see it better if you take them off. Click on the power box on the light pole on the left to open it. Click again to turn the power on. Click on the shop door to open it. Once the door is opened click on the switch inside to turn on the sign. Click on the sign letters to turn them off until the only ones lit up spell "PLAY". The title and the fedora are the clues. The answer is Indiana Jones. You are facing a locked door. Note the two red buttons above (A and B) and the arrow patterns. Click on the left of the scene to move to the "Power A" section. 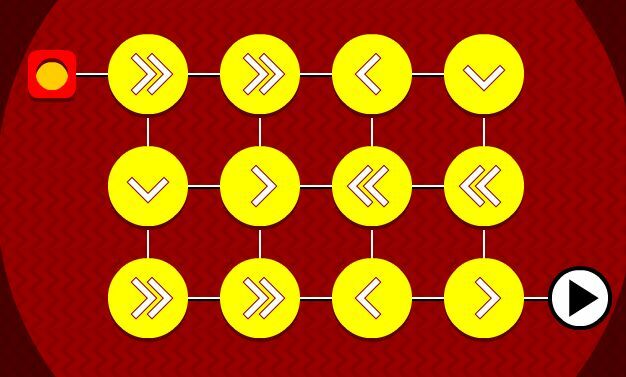 Set the levers to match the arrow patterns for A. Upper row: down, down, up. Lower row: up, down, down. Click to the right to go back to the door. Click to the right of the door to go to the "Power B" section. Again, use the arrow patterns to set the levers. Upper row: down, up, down. Lower row: up, down, up. Click to the left to go back to the door. Click on the button between the A and B buttons and a ladder will come down. Click on the ladder to move up. Once you are above the door, click on the big arrow to go down below the door. Once you are below the door, click on the cabinet above the big arrow. Open both sides, in one you will find a key. Take the key. Click on the big up arrow to go to the space above the door. Click on the ladder (not the big down arrow) to go back to the door. Click on the key and drag it to the door to unlock. The only clue is "M-D". Well, the title is another clue. What month and day is Halloween? 10-31, that's what. Something weird is going on here - the last two clickplay games haven't worked at all well on my computer. Super laggy, and it makes firefox run really slowly until I close the game. No problems with any other games. Have other people encountered the same thing? Usually I'm cultured enough to guess the answers to the scrambles, but Level 14 stopped me cold. John Clamnec? John Malccen? John Alcmecn? I've got absolutely nothing. The clue at the top is a quote from the movie Die Hard. The character's name is John McClane. John McClane. You know, from Die Hard? Thanks for the quick response, Trinn! I don't suppose you can give me a push for Level 20, too? My first thought was that "M-D" was a subtraction problem in Roman Numerals, the answer to which was 500 (M = 1000, D = 500). That didn't work. I also tried 1,500, which didn't work either. I have no idea what else to try, or how the title ("Happy Halloween") fits into the equation... a hint would be appreciated! Thanks! I could've sworn I'd already tried that. Beat it now... with a disappointing one shuriken. anna.m.page, you're not the only one. It seems like the games don't like Firefox or something; they play fine in Chrome. Thanks, I really should have thought to try that first. Good to know its not my computer! My first play-through took a while. More than 800 seconds. I got one shuriken. My second play-through was zippy. Less than 300 seconds. I got two shuriken. Yeesh. Looking at a flatscreen monitor from the wrong angle helps much more than squinting. The thing is.. I can play this game with absolutely no lag whatsoever on Bart Bonte's website on Firefox.. but it lags terribly here. I've tried IE (don't have Chrome installed) and while there was less lag, there was still some. So I don't think it's so much a Firefox issue at this point. That aside.. cute little game but I had to refer to the walkthrough for at least half of the name scrambles. Level 4 (Counting Letters) is plain stupid. Entering the letter T (20) as 2 and 0 into two boxes makes no sense and appears totally wrong to me, so I ended up with 13 5 15 23, shortened that to the cross sums of 4 5 6 5 and gave up finally.